BRENTWOOD, N.Y. -- Police on New York’s Long Island are investigating the murders of two teenage best friends in a possible gang-related attack. Police say 15-year-old Nisa Mickens was found dead from an apparent beating near an elementary school in Brentwood Tuesday night. A driver who saw her body in the street reportedly contacted police. 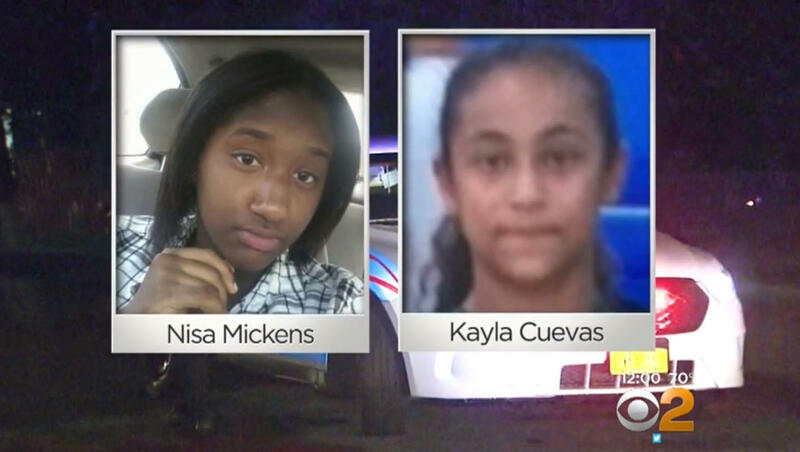 Mickens’ 16-year-old best friend, Kayla Cuevas, who police say was with her the night she was killed, was reported missing. The teens had both left Cuevas’ house in Brentwood together Tuesday evening, but it wasn’t clear where they were going. On Wednesday, Cuevas’ body was discovered in a wooded area behind a home near where Mickens was found after a community member called a tip into police. Suffolk County police commisisoner Tim Sini said both teens, who were high school students, had similar wounds and died of blunt force trauma. Each had significant injuries to the head and face and and also suffered cutting injuries. He said there are “strong indications” the slayings were gang-related, including the brutal nature of the injuries inflicted. “These murders show a level of brutality that is close to unmatched,” Sini said. Sini said he believed the girls were both killed Tuesday but wouldn’t say whether invesitgators believed the girls were killed in a different location than where their bodies were found. Police are stepping up security and police presence at Brentwood High School, reports CBS New York.